ADA Requirements for indoor tables at restaurants and bars were established to ensure seating opportunities for people in wheelchairs. 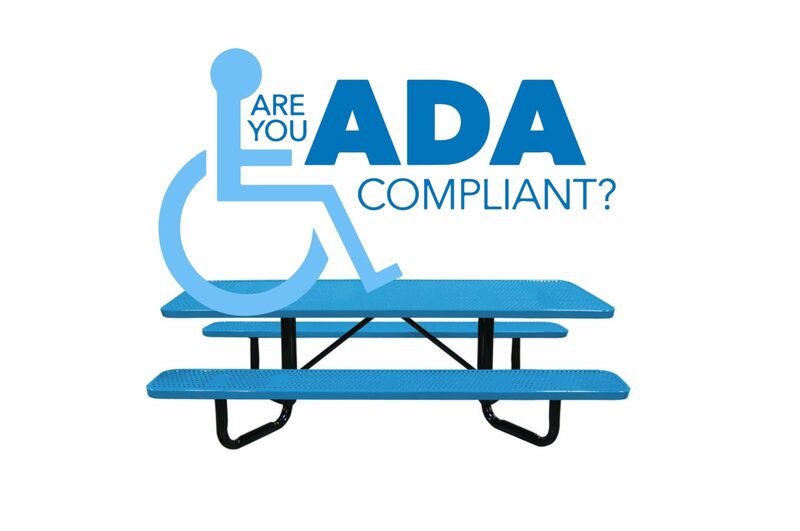 According to the ADA compliance rules, if tables are provided, such as in restaurants and snack bars, and the tables are attached to the wall or floor (fixed), then 5% of the tables (or at least one if less than 20) are provided must be accessible to people using wheelchairs. Movable chairs can be used for these tables and the movable chairs can be removed when customers using wheelchairs use the table(s). -A surface height of no more than 34 inches and no less than 28 inches above the floor. -At least 27 inches of knee clearance must be provided between the floor and the underside of the table. -An accessible route to each accessible table and a clear floor area 30 inches by 48 inches is provided at each accessible seating location. This clear floor area extends 19 inches under the table to provide leg and knee clearance. -If it is not achievable to provide the minimal number of accessible tables in all areas where fixed tables are provided, then the ADA accessible tables must be provided in another accessible location. However, these alternate location(s) must be available for all customers and not just people with disabilities. It is illegal to segregate people with disabilities in one area by designating it as an accessible area to be used only by people with disabilities. -Benches should have one seat removed or one side of the bench made shorter. This grants proper space for a wheelchair to approach and comfortably sit at the table. -There must be 36” clearance on all usable sides of the table, this measurement is taken from the back edge of the bench. -There must also be enough knee and toe clearance beneath the table, measuring 27” in height, 30” in width, and 19” in depth. These measurements provide ample space regarding maneuverability and comfort. Section 903 of the ADA and ABA Accessibility Guidelines for Buildings and Facilities requirements were developed to enable people in wheelchairs to transfer to benches in certain functions and situation-specific settings like: Saunas and Steam Rooms; Dressing, Fitting and Locker Rooms; Holding Cells and Housing Cells and Courtrooms. In other words, there are no ADA legal requirements specified in Section 903 for your standard use outdoor bench. However, it is a great idea to make an effort to apply the Section 903 standards to benches in outdoor public environments, in order to ensure seating opportunities for people of all mobility. – Seats should be a minimum of 17-inches in height and a maximum 19-inches above ground. – They should be equipped with handrails to assist with sitting down and standing up. – Benches should be placed on a firm and stable ground surface that provides enough clearance space to move it as needed. – The minimum clearance of ground space is 30” x 48” in order to properly accommodate a wheelchair with occupant. – There should be enough space surrounding benches for people to join in when they are sitting in their wheelchair. Leaving plenty of space for a wheelchair to claim a spot at the end of the bench parallel to the short axis of the bench allows wheelchair users to easily interact with others from their chair. At Park Warehouse we strive to provide our customers with a wide selection of ADA compliant out door site furnishings. If you are looking to make your space ADA compliant give us a call and our knowledgeable team can help you get exactly what you need.